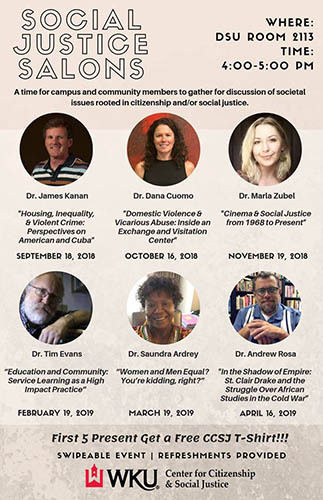 “Social Justice Salons” is a lecture series for WKU faculty, staff, students and community members to gather and discuss complex contemporary issues surrounding citizenship and social justice. The typical format of “Social Justice Salons” includes a short presentation on a topic, followed by facilitated discussion. The salon is open to anyone interested in participating. Refreshments will be provided. More: Follow WKU CCSJ on Facebook or Twitter. Contact: Leah Ashwill, leah.ashwill@wku.edu or (270) 745-3218.